the Peavey® PVi® 6500 is a revolutionary all in one powered mixer. 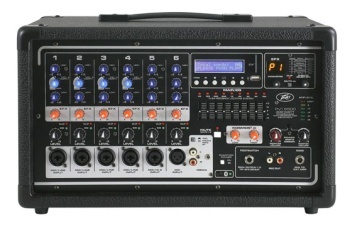 Everything a musician needs providing up to 6 simultaneous combination XLR and 1/4" inputs using Peavey's award winning Silencer® mic preamps, and 400 watts of power for crystal clear audio reproduction. The Peavey PVi 6500 uses exclusive and patented features like Mid Morph EQ to accurately help improve tone and clarity of vocals. Feedback is quickly and easily identified and removed with Peavey's 9 band graphic EQ combined with our patented and revolutionary FLS® Feedback Locating System. The PVi 6500 is equipped with Kosmos, which drastically enhances both the low and high end of the audio spectrum and is exclusively Peavey technology. Footswitchable built in 24 bit digital effects compliment the already feature packed unit by allow the user to select multiple varieties of reverb and delay. Connect almost anything to this versatile mixer via the onboard 1/4", RCA and 1/8" mini jacks. Master Mute for Channels 1-5. Footswitchable effects defeat and Master Mute. Dual power section with independent control. On-board 24 bit digital effects. Weight Unpacked: 20.02 lb(9.08 kg). Weight Packed: 22.29 lb(10.11 kg). Width Packed: 14"(35.56 cm). Height Packed: 19.75"(50.165 cm). Depth Packed: 13"(33.02 cm).